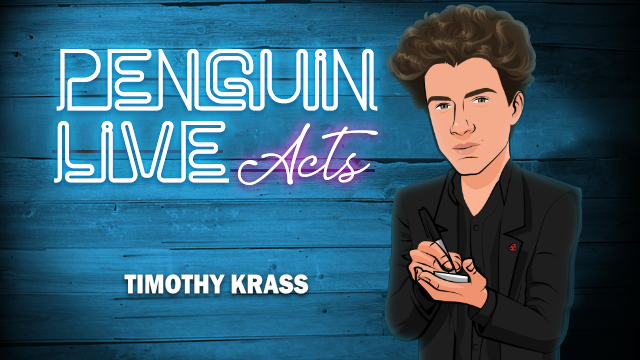 Today, when you order "Timothy Krass LIVE ACT", you'll instantly be emailed a Penguin Magic gift certificate. You can spend it on anything you like at Penguin, just like cash. Just complete your order as normal, and within seconds you'll get an email with your gift certificate. Timothy Krass LIVE ACT: Sunday May 5th @7:00pm Eastern. 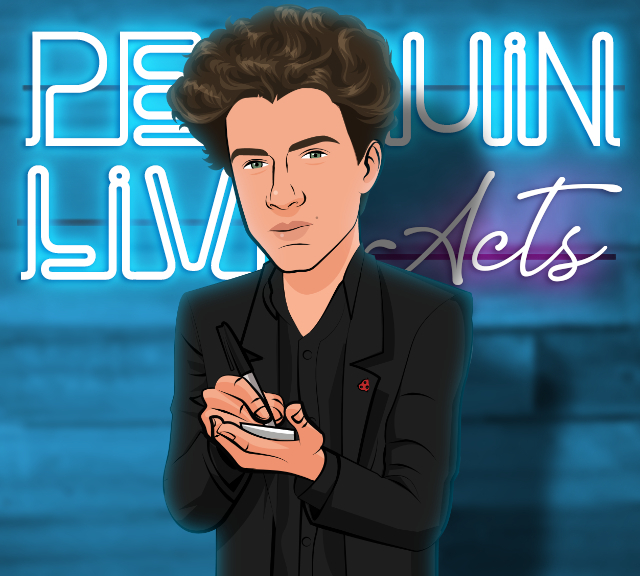 (Penguin LIVE) SUPPORT LIVE MAGIC. RESERVE BEFORE SUNDAY AND SAVE. "Whilst there are many mentalists that I admire, there are very few inspire me as much as Timothy Krass. His character, his energy and his passion for the art are very much unparalleled. Timothy is not just a mentalist, he is so much more, he is an artist, a philosopher, a poet. Having had the privilege of seeing him perform and reading his thoughts over the past two years, I am very envious of those who are about to experience this for the very first time. Quick Opener - Everyone stands and one by one the audience members sit down based on their thoughts until only one remains standing. The standing spectator then has their mind read in the most direct way. A 40-60 second high-impact opener! Mental Pickpocket - Beautifully choreographed PIN reveal with an original pickpocket sequence. Tossed Out Die - Presentation involving 4 people and several (often darkly funny) additional reveals. Can also be used with a standard tossed out deck. Hypnosis - Hypnosis Set with no hypnosis needed! Featuring the Waveless Wave Technique. Dreams - REAL TIME Dream revelation with a member of the audience. Musical Finish - Not mentalism, but a piece of music. Wonderfully magical. Born in Germany, trained in New Zealand and now based in Amsterdam, Timothy Krass has traveled 6 of the 7 continents with his show. He currently performs in theater settings almost exclusively. Timothy won Dutch Champion of Mentalism 2014-2015, Nostradamus D’Or 2016 - 2018 ('Best European Mentalist’) & the Cagliostro Award 2016 - 2018 ('Best European Mentalist Audience Award') and was the youngest ever recipient for all of these three. He fooled Penn & Teller in 2016 and was Holland’s Got Talent Finalist in 2017. He is also a two times TEDx Speaker: once in 2017 ("How to Manipulate Emotions") and once in 2018 with part of his show ("This is How I Steal a PIN Code”). He released his first mentalism book in 2011 at just 16 years. Krass just finished touring through 65 theatres in the Netherlands with a solo-show which is set to return in fall. He is currently preparing another live tour in Germany, after the successful release of a communication tactics book in Germany that went on to be Amazon #1 bestseller twice. Timothy finished a study at a Dutch performing arts academy simultaneously to studying philosophy. His philosophy degree was centred around his thesis on “Philosophy of Magic”. Purchase this product and on May 5th anytime after 12:00pm Eastern, click the MyPenguinMagic area at the top of the Penguin site. You'll see the "learn" button appear next to this lecture.